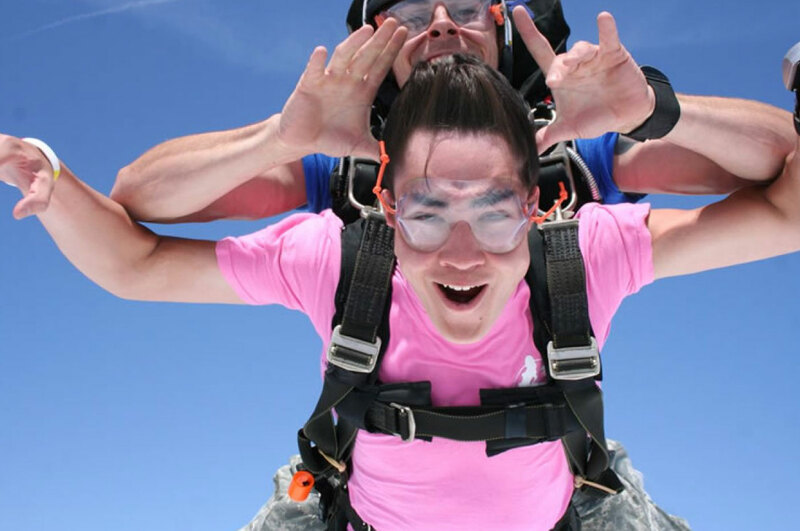 At Music City Skydiving we offer the highest quality videos available in the industry. Our videos of your skydive are shot on high quality digital HD cameras. Each video is professionally edited via computer and set to music. For Handcam and Standard Packages you generally receive your video and photos via a file sharing link typically within 1 to 3 days of your jump. Sometimes even the same day. With this package your instructor will wear a glove modified to hold a small HD camera. We film a pre-jump interview, in aircraft interview, then video the exit and freefall. You then get a unique interview under the parachute just after it opens and some during the parachute ride. This footage is only available with Handcam and Premium Packages. Then the instructor does a post-jump interview. No landing footage nor still shots are included with this package. In the Standard Package a specially trained freefall photographer films the video and takes photos. The photographer wears a helmet modified to hold both the video and still camera. With this package you get a pre-jump interview, in aircraft interview, exit/freefall footage, landing, and post jump interview. The photographer will shoot 50 to 100 still photos throughout. In the Deluxe Video Package, our video editors will use our professional editing software to combine elements and scenes from both the outside video and handcam into one. In addition, personalized titles and dates are added. As with the Standard Package the photographer will shoot 50 to 100 still photos. Due to the amount of personalized editing, please allow one week for delivery.